Prime Minister Stephen Harper announced today the appointment of Mr. Kevin MacLeod, CVO, CD, as Canadian Secretary to The Queen. The Canadian Secretary to The Queen coordinates the planning and delivery of Royal Visits to Canada through close partnership with various government officials and the Royal Households. Mr. MacLeod will lead the planning of Royal Visits expected to take place in 2009-2010. He will also chair the Diamond Jubilee Committee – celebrating Her Majesty’s 60th anniversary as Queen of Canada in 2012. 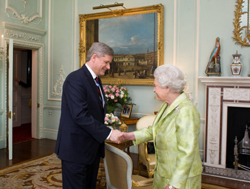 Mr. MacLeod has extensive experience in organizing Royal Visits. Since his first involvement in the 1987 visit of Her Majesty to Canada, he served twenty-two years with the Department of the Secretary of State (later Department of Canadian Heritage), and held the position of Chief of Protocol. He is the recipient of several honours and decorations, including Commander of the Royal Victorian Order (CVO), presented personally by Her Majesty The Queen in 2005, for personal service to the Sovereign. Mr. MacLeod served as acting Canadian Secretary to The Queen during the 2005 Royal Visit of Her Majesty The Queen and His Royal Highness The Duke of Edinburgh . Mr. MacLeod was appointed Usher of the Black Rod, Senate of Canada, in March 2008, and he will continue in this role.